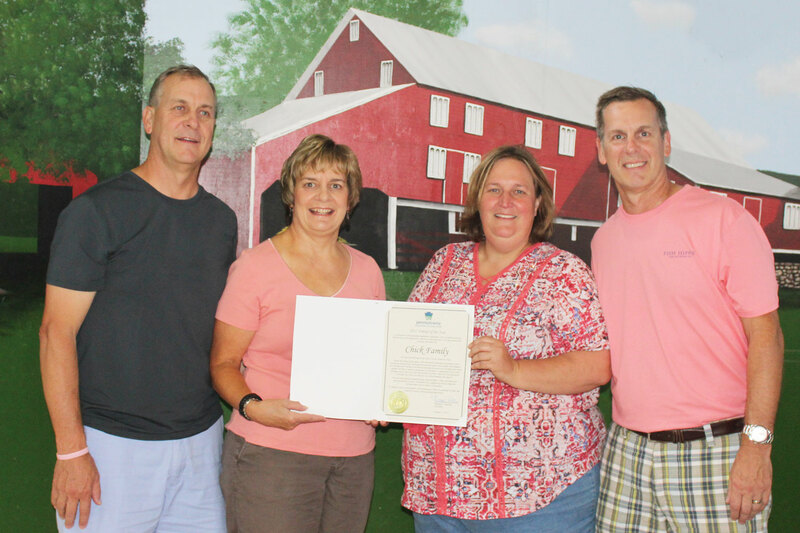 2017 Friend of the Fair – The Chick Family (L to R) Steve, Linda and Brian, with Secretary Barb Franck. August 11, 2017 — The Chick family has been involved with the fair for many decades. Both George and Priscilla served on the fair board in officer positions and as department superintendents. George’s love of sheep and lambs made him the perfect person to run that department. In the community, Priscilla was a 4-H leader. She inspired the children in her club to live by the motto “To Make the Best Better.” In the exhibit building, Priscilla was busy helping with entries and needlecraft. She also helped in the office until her health prevented her from doing so. During this time, their children Brian, Linda and Steve were building a bond with the fair as well. They exhibited animals through 4-H and FFA and helped their parents where they could at the fair. Eventually, the Chick children would become adults and with jobs and marriages, they moved from the area. However, that bond with the fair didn’t end. Brian, Linda and Steve have kept their parents spirit alive within our fair community by creating 2 awards in George and Priscilla’s memory — the George L. Chick Best Breeding Sheep Award and the Priscilla S. Chick Best of Show Needlework award. 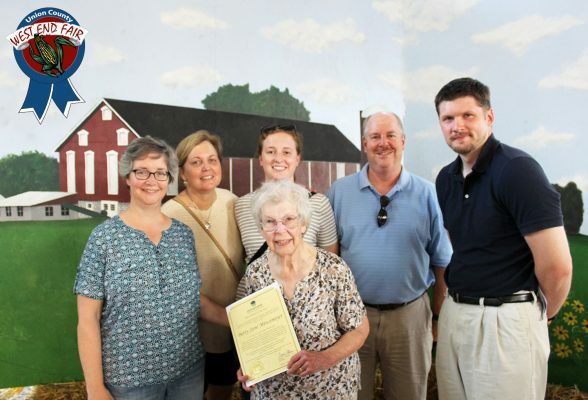 August 5, 2016 — 2016 Friend of the Fair honoree Betty Jane Mincemoyer with her daughter Beth Mincemoyer Egan, daughter-in-law Claudia, granddaughter Hanna, son Tom and Pennsylvania Department of Agriculture State Fair Coordinator Zachary Gihorski. Betty Jane Mincemoyer, age 90, began her lifelong love of agriculture and Pennsylvania’s Fairs as a child in Blair County. She participated in 4-H until the time she enrolled in college. After college, Mrs. Mincemoyer took a job as a home economist with the Penn State Extension which brought her to Union County in 1953. She began volunteering at the Union County West End Fair while in extension and soon met her husband, Donald. The newlyweds moved from Union County for a few years but came back and purchased a farm to raise their young family. By 1971, Betty Jane Mincemoyer was teaching Home Economics in the Mifflinburg High School. When asked, Mrs. Mincemoyer has said her greatest achievement at the Union County West End Fair was getting the younger generation involved and interested in the fair. 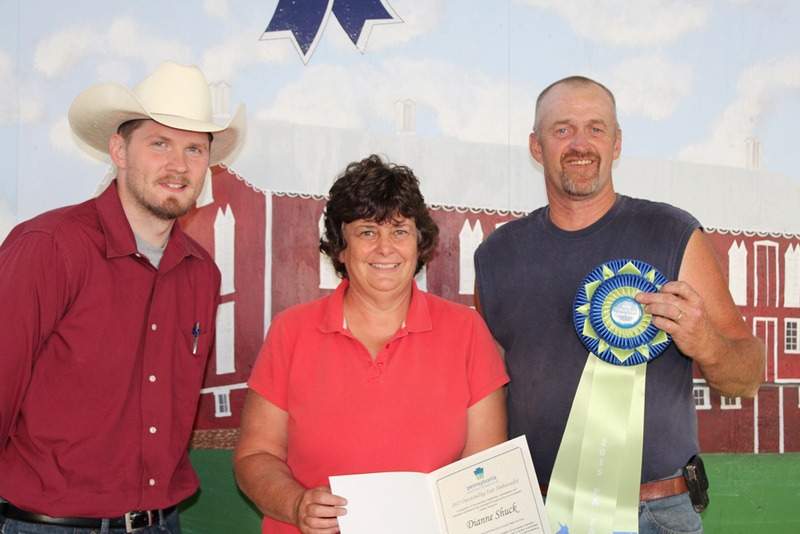 August 7, 2015—Dianne Shuck was recognized as the 2015 Outstanding Fair Ambassador, pictured with President Dennis J Boop (right) and Special Advisor to the Governor of Agriculture, Zachary Gihorski, of the PA Department of Agriculture. Dianne has been coming to the Union County West End Fair since she was a toddler, showing Dairy Cattle in her teens, and then joining the Association in her early 20’s. Dianne has served as a member of the Board of Directors, President, Secretary and Treasurer. She has helped on the concession committee and worked in the office for over 35 years.